I wash my face with Perricone MD Nutritive Cleanser. I generally avoid foaming cleansers (and it does contain sodium laureth sulfate) but this one has enough clever and benefitial ingredients to tempt me and I don't find it drying. It's very gentle and has a soft baby powder smell. The key goodies are alpha lipoic acid – an antioxidant said to protect skin cells and refine skin texture – and DMAE – said to diminish the appearance of fine lines. It's also quick to use. A few mornings a week I use Alpha-H Micro Cleanse. Totally addicted to this stuff. You may remember the Alpha-H facial I had last summer. Well, the therapist, Jodie, used this on me and it was incred(ible). I'm not usually a fan of physical exfoliators but the micro-beads in this allow you to manipulate the product while the 12 per cent glycolic acid does its stuff! Probably not one for sensitive skin, however. I then apply Perricone MD Advanced Face Firming Activator. This features the same two key ingredients as the Cleanser and also sodium hyaluronate to help skin retain water. I have really noticed the difference since I started using this product. I have had far fewer spots and my skin has looked more radiant. Slightly odd fishy smell but hey, I can live with that. The smell fades immediately upon application. Still on the search for the holy grail 'wear it everyday and it's almost a pleasure' sunscreen I bought Shiseido Urban Environment UV Protection Cream Plus SPF 50. It's not broken me out and my face hasn't burned but it has coloured and gone freckly. I prefer to try to keep my face as pale as possible while being totally slack on the rest of my sun protection. Okay I don't actually 'prefer' to be slack on the rest but let's just say the face is the priority, okay? I'm also not keen on the suncreeny smell and it makes me mega shiny when I don't have remotely greasy skin. Would not repurchase (but it's not, not working, so it's in the regime still, plus it was expensive so I'm not getting rid). First up is Suti Cleanse Organic Balm Facial Cleanser (which I reviewed here). Still loving this as much as ever and have just ordered a new pot. I massage this in without wetting my face and then remove with a muslin cloth. I feel confident that this takes off all of my makeup but if I've been wearing sunscreen or am feeling particularly goodie goodie I will either double cleanse with this or do a second cleanse with the Nutritive Cleanser mentioned earlier. I remove my eye makeup with Bioderma Crealine H2O, which is gentle and no-fuss. I got mine in Paris but think you can now buy in the UK. The Suti Cleanser leaves my skin feeling nourished enough to forgo moisturiser most nights but hey, I'm a beauty addict and can't resist adding in a little facial oil for night time treatment benefits. I am currently using Suti Rejuvenate Face Oil, which is delicious. It smells amazing and contains a host of skin-saving ingredients such as evening primrose oil, frankincense, rosehip seed oil and argan oil. This has helped to accelerate the healing of spots and fade old scars. I like using an oil in the evening as it feels pampering and luxurious as well. To tackle individual spots (not that I have many using this routine) I use (MALIN+GOETZ) Acne Treatment. This stuff contains sulfur, salicylic acid, camphor and zinc to calm spots and send them packing. You apply with a cotton bud and it leaves white splodges all over your face. My boyfriend loves me in this! Ha. I am shameless. I'm also taking two of the Well, Well, Well Krill Oil Supplements daily. As I take a lot of harsh medication for my RA, plus I'm vegetarian (although I eat fish) I think these are probably a very positive addition for me. It's only been a couple of weeks so far but my skin is clear and I feel like these will help me to keep it that way. They smell fishy but you can't taste anything. Avoid if you have an allergy to shellfish. Jeez that seems like a lot of writing about what I use on my face. I've ordered some Alpha-H Liquid Gold to add into my night time routine a few nights a week in place of the Micro Cleanse in the morning (it has run out). I'm also thinking I should probably use a toner after cleansing and actually apply one of the five eye creams I have kicking about. I'm not getting any younger! I've come to realise that where my skin is concerned, I am willing to pay for products that work. I'm not blessed with perfect skin so what's the point in throwing cash at nice clothes and meals out but skimping on my face when that's the one thing that gives me the confidence to face the day? I hope this was vaguely interesting/helpful. Leave me a comment if you have any product raves or questions! *My skin is normal/dehydrated and prone to congestion of all wonderful varieties! Try the REN spf product. It's only SPF 15 but is gorgeous to use. 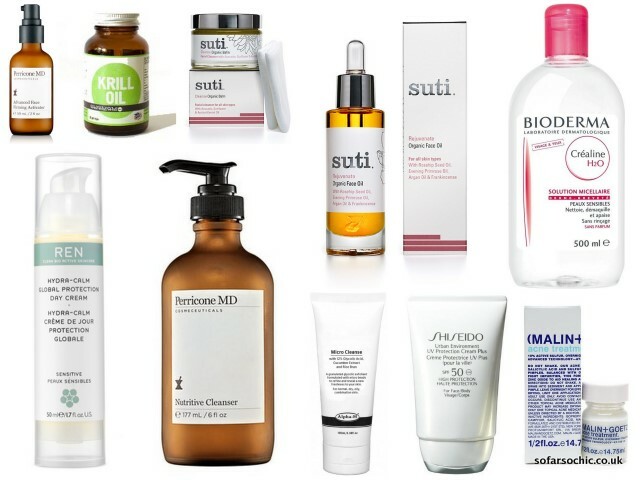 Really want to try the Suti products, this just makes me want to try them more! Great post, I need to do something similar as I'm using lots of nice products at the moment. I've been using the Perricone cleanser too which I like and agree with the baby powder description but the scent also reminds me of sugar puffs sometimes? I've just come across your blog and I love it! Love the details in this post as many people sometimes skim over the descriptions.